Home / Editor's Choice, Entertainment News, Featured Articles, Forum and discussion, Lifestyle, Media News / End of an Era! Nation Media Group’s NTV to stop airing this popular show this month after 14 years. End of an Era! Nation Media Group’s NTV to stop airing this popular show this month after 14 years. 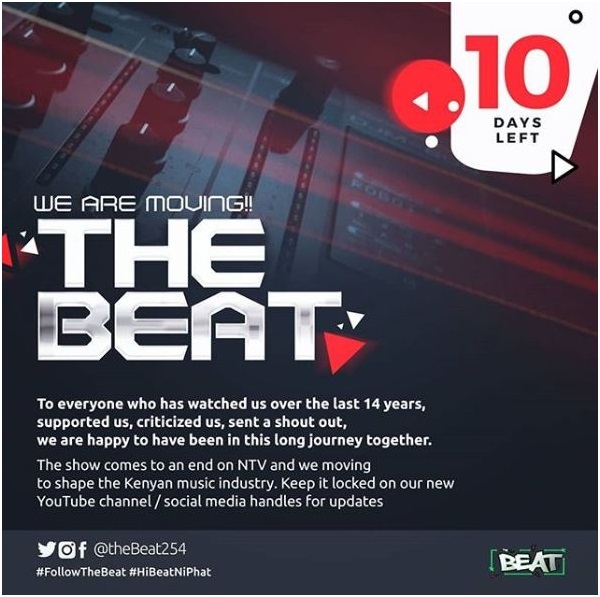 Wednesday, August 01, 2018 - Nation Media Group’s NTV will stop airing the popular music show ‘The Beat’ from the second week of August. The entertainment show which airs from Monday to Friday from 5 pm to 6 pm, revealed on social media that it has not renewed its contract with the Agha Khan owned media house which ends this week. “To everyone who has watched us over the last 14 years, supported us, criticized us, sent a shout out, we are happy to have been in this long journey together,” posted the show. The Beat, which is without a doubt one of the most watched music show in East Africa, was started by the veteran and Kenyan pioneer Disc Jockey, DJ Pinye.